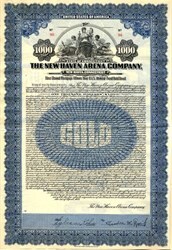 The New Haven Arena was an indoor arena on Grove Street in New Haven, Connecticut that served as a venue for ice hockey, concerts and circuses. The first arena opened in 1914 but burned down in 1924. The new arena was built in 1926 and held over 4,000 people. The Arena hosted the American Hockey League's New Haven Eagles from 1936 to 1951, the New Haven Blades of the Eastern Hockey League from 1954 to 1972 and Yale Hockey from 1914 to 1917 (at the first Arena) and from 1927 to 1959. The Rolling Stones, the Kinks, Bob Dylan, Joan Baez, the Supremes, the Temptations and many music icons of the 1960s held concerts at the Arena. Jim Morrison, of the Doors, was arrested for obscenity here on December 9, 1967 after mocking a cop during a performance of "Back Door Man". The event was memorialized in the song Peace Frog. The site of the arena is now the headquarters of the New Haven Division of the FBI. The Arena was replaced by the New Haven Coliseum in 1972.